This is the CWY staticline system I use. I don’t have a clue who invented it in the first place, but discussions about it on bj.com date back quit a while, so its rather old and a lot of people are using this. This is actually the second half of a double post, so before you start, read this. 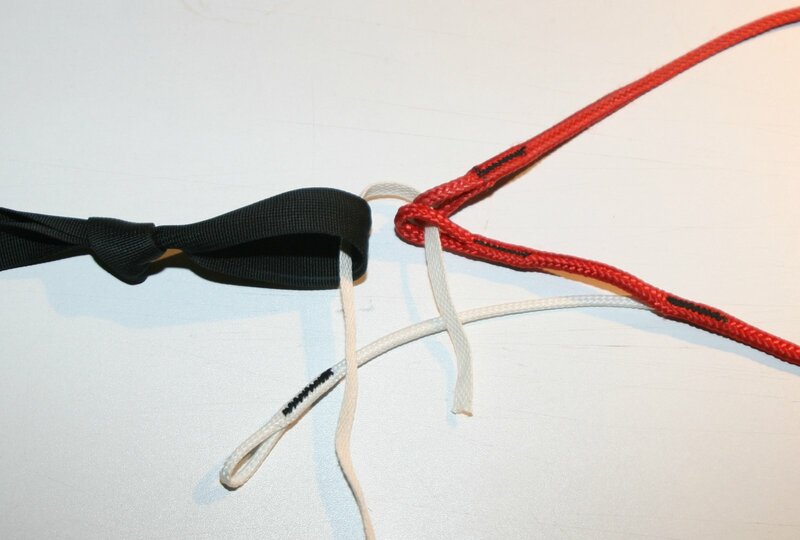 The red part (900 lb Dacron) is the actual staticline that goes around the anchorpoint and is attached to the bridle with breakcord, while the white part (525 lb Dacron) is responsible that the system stays with you after the staticline has done its job. 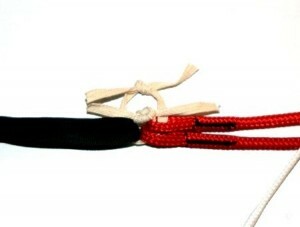 Put a piece of breakcord through both load taking ends (the red ones) and through the loop on the bridle and close with a surgeons knot. I make this first loop rather small. I add a second loop of breakcord, routed same way as the first one but make it a little bigger (app. 1 cm wider), to ensure that its loaded after the first one broke. Back up both surgeons knots with a few knots on top to ensure they cannot move. 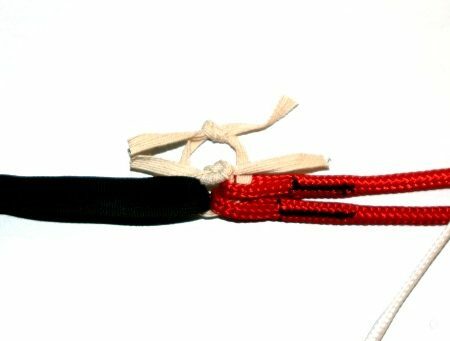 At last I attach the white end of the staticline to the bridle, also with a loop of breakcord closed with a surgeons knot. This will pull the staticline off the object after the breakcord broke and released both red ends. 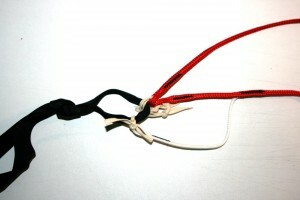 Make sure that it is not going to be loaded before or at the same time as the wider breakcord loop, because then you would loose the staticline (its most likely that it will just fall off the object in that case), if in doubt make the breakcord loop you attach the white end with a bit longer. The white end can also be attached to the bridle with a larks head, although I prefer a loop of breakcord just case that your staticline system would snag somewhere (although unlikely since the longer end that goes around the object is only spliced and has little snag potential). In 50 staticline jumps with this system I lost it in two cases (found both again at the bottom of the object). Shape of the anchor point and and friction play a role there. On the object I open the rapide link to put the staticline on the anchor point. Take care that the carry with you part is on the upper side. 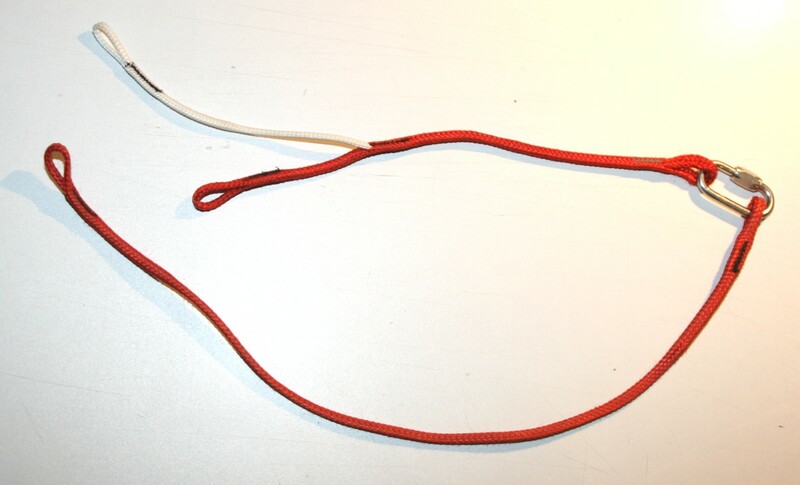 One could also use the staticline without the rapide link and the longer part, but then you have to do the knots on the exit. I did some static line testing today, and sent you an email with preliminary results. I will try to edit up the video to send to you as soon as possible.